If you've made it to the very end of my CbL Summer review earlier today then you might have been expecting this post : the Harlow & Co exclusive duo, Rapture and Bring Us The Girl! Bring Us The Girl is a beautiful peachy pink holo with bright pink sparkles. I've grown to love pinks with time but I'm pretty sure I would have loved this one during my runs-offs-from-pinks phase. Perfect application and a 2 coats coverage. Rapture is a medium turquoise blue holo with a muted look. I can never have enough turquoises so of course this one was a must have for me! Strong linear effect and flawless application, I also used 2 coats below. 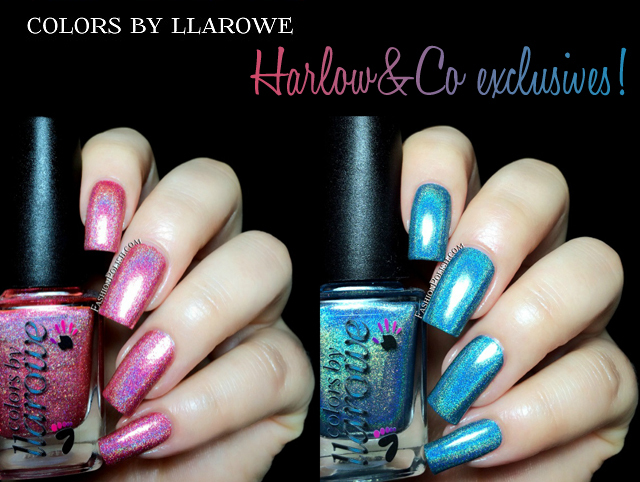 Colors by Llarowe Harlow & Co exclusives Rapture and Bring Us The Girl are only available on Harlow&Co.org. I got mine during the very first restock and they sold out within minutes but they are not limited editions and will make several some backs. What do you think about these? Aren't they the perfect holo duo?